East of 22nd Street the character of the City changed to residential outside the Railroad Reservation. The future would bring a new viaduct at 24th Street by 1920, and another by the 1990's. In addition, North First Street would be elevated to cross the busy railroad junction starting to develop at the upper right of this view. Remember that Birmingham was founded at the junction of two railroads. In this view the L&N tracks to the north go off in the top right hand corner. 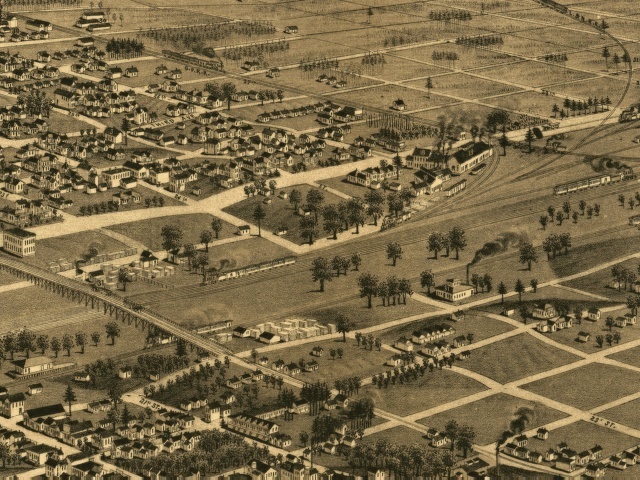 The (then) Georgia Pacific RR tracks go out of the top left corner of the picture. The main tracks, crossing from left to right include the L&N and the Georgia Pacific lines to the west and south. At the junction we see the Birmingham Iron Works, noted in the legend as "Wm. Hardie, General Manager." Later, a new industry would develop, Hardie Tynes Mfg. Co., which is still in business today.